By the reign of Michael III (842-867AD) the balance of power between the Byzantines and the Abbasid Caliphate had shifted significantly. The Abbasid economy was in decline and the government paralysed by religious and political factionalism. The Byzantines exploited Abbasid disunity to take the offensive and over the course of two centuries recovered their lost provinces of Illyricum, Greece, Bulgaria, Northern Syria, Cilicia, and Armenia. Byzantine expansionism reached its peak with Constantine IX Monomachus’ annexation of the Armenian city of Ani in 1045AD. Yet, at the same time as Constantine was celebrating Ani’s annexation, a new player in international affairs arrived on the scene – the Seljuk Turks. Romanus’ immediate predecessors cannot be held entirely to blame for the mediocre state of the Byzantine army in the mid-eleventh century; the policies of the military emperors of the tenth century were also a contributing factor in Byzantium’s military decline. Historically, Byzantium had relied on defence in depth, rather than stationing large garrisons of troops along Byzantium’s borders. 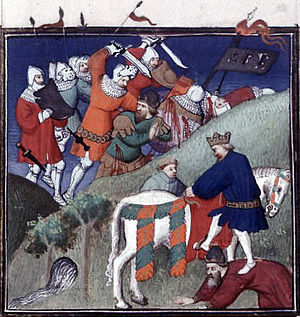 Three professional armies, calledtagmata, were stationed in western Anatolia, Constantinople and Thrace where they could be quickly mobilised in response to an invasion. Every city in the Empire also had a garrison of local troops for defence and policing actions. These thematic troops were not full time soldiers, but were farmer-soldiers who received a grant of land in return for periodic service. The system of land use in Byzantine Anatolia was also a key factor assisting the Turkish conquest. As horse and sheep herding required less manpower than small-hold farming, the creation of great pastoral estates led to the displacement of the peasantry and general depopulation of the plateau. To the original Turkoman raiders, the virtually undefended great estates and their immense herds of livestock were targets too tempting to ignore. As they plundered their way across Anatolia the scattered population fled westwards or to the cities and coasts,virtually abandoning the plateau to the Turks. The economic impact of this loss was not as great as might have been expected as the central government had long lost its ability to collect taxes from, and enforce its authority over, the Anatolian magnates. The areas of real agricultural prosperity – the coastal districts and the rich farmland of Bithynia and the Meander valley – remained in Byzantine hands. Ethnicity was irrelevant in the multi-ethnic Empire that was Byzantium. Anna Comnena might call the Turks barbarians, but it was a term she also used to describe the Normans, Italians and Franks. To be considered a Byzantine one needed accept Orthodox Christianity and have an appreciation for civilised culture, that is, classical literature, order, rule of law and other such amenities of civilisation. Accepting the Turks as foederatiwas the first step in a longer process aimed at transforming them from barbarians into Byzantines, much as the Byzantines had transformed the pagan Slavs, Bulgarians and Russians before them. Even the Turks’ Islamic faith was not considered an insurmountable obstacle to their hoped for integration as the Turks in the eleventh century did not distinguish greatly between Islam and Christianity. The Rum Seljuks placed no restrictions on the Christians within their territories. This was significant as many Byzantine officials occupied key posts at Seljuk court. Some, such as Philaretos’ son converted to Islam, but this was not a requirement. Many Byzantines stayed true to their Christian faith and this does not seem to have hindered their career. Indeed, the Rum Seljuks recognised the right of the Patriarchate of Constantinople to exercise full ecclesiastic authority over the Orthodox Christians within their territories, despite having a rival Patriarchate under their control at Antioch. Finally, the Seljuks use of Byzantine coinage, while important symbolically, permanently disrupted the Empire’s carefully balanced economic cycle. The Byzantines had very limited gold reserves and so carefully regulated the circulation of gold nomisma within their economy. All taxes had to be paid in currency, which guaranteed that most coinage circulated through the economy but ultimately returned to the treasury. Unless politically sanctioned, gold exports were strictly prohibited. The Seljuk court however became a significant consumer of coinage, which over time eroded Byzantium’s gold reserve. This significance of this cannot be overstated and over time was probably more damaging to Byzantium’s long-term viability than any loss of territory. 9. John Kinnamos. Epitome. 12th century. Translated by Charles M Brand, 1976. Published as TheDeeds of John and Manuel Comnenos. Columbia University Press, New York. 12. Michael Psellus. Chronographia. 11th century. Translated by E R A Sewter, 1966. Published asFourteen Byzantine Rulers by Penguin Books, Harmondsworth. Vardapet Aristakes Lastivertc’i. 11th century. Regarding the Sufferings Occasioned by Foreign Peoples Living Around Us. Translated by Robert Bedrosian. Published by Medieval Source Book @http://rbedrosian.com/a1.htm pg 3. Successive Byzantine emperors from Michael IV (1034-1041AD) through to Constantine IX sent troops into Armenia but failed to take it. Lastivertc’i uses the archaic term Persians when he in fact means Turks. @ http://rbedrosian.com/a8.htmpage 1. The historian Michael Attaleiates served with Romanus on his campaign and has left us a grim account of his experiences. We should not necessarily take Attaleiates account at face value though, as Attaleiates’ was seeking to place the blame for Byzantium decline on Romanus’ effete predecessors and therefore emphasized the difficulties Romanus’ faced. Paul Magadalino. The Byzantine Background to the First Crusade. 1996. Canadian Institute of Balkan Studies, Toronto. @http://deremilitari.org/RESOURCES/ARTICLES/magadalino.htm. Eokoimene, meaning community (of believers). Catherine Holmes argues that the administrations of Nicephorus II and Basil II took care to ensure the trade of Syria was preserved by encouraging Muslims to remain resident in the provinces and leaving the indigenous administration intact (‘How the east was won’ in the reign of Basil II, from Eastern Approaches to Byzantium @www.deremilitari/RESOURCES/PDFs/HOLMES.pdf.) P D Whiting (Ibid, pg 173) supports this analysis with speculation that the gold tetarteron introduced by Nicephorus II was intended to replace the Fatimid dinar. Haussig, however, points out that the failure to integrate the new conquests into the Byzantineeokoimene meant the central government was left to bear the costs but was unable to secure the benefits, which accrued to the Anatolian magnates (ibid, pgs 304-05). Also see Haussig, pg 59 for a discussion of the causes of the 3rd century inflation in the Roman Empire. Manzikert was a key fortress on the Armenian frontier and had been held by the Turks for several years. Psellus and Lastivertc’i are highly critical of Romanus’ decision to split his army, attributing his decision to engage the Turks with only half his forces to arrogance. Psellus. Ibid, pg 355 & Lastivertc’i,http://rbedrosian.com/a10.htm pg 2. Niki Gamm. ‘Celebrating the Beginning of the Beginning.’ Turkish Daily News. 29 August 1999. @http://www.turkishdailynews.com/past_probe/08_29_99/Art2.htm viewed 14 September 2004. The attitude of Anatolian aristocracy can be summed up by the writings of Kekaumenos, who was a contempory of Romanus IV. As far as possible, the Anatolian landowners sought to secure their own advantage and avoid the authority of the central government. N. Kekaumenos. Logos Nouthetetikos orOration of Admonition to an Emperor. 11th century. Translated by W North, 1972. It has been speculated that Kekaumenos was either the same Kekaumenos who was abused by Michael VI Bringas in 1057AD, or his son.